Even though Ubisoft is still hard at work putting on the final touches to their most anticipated game of this year, they have still managed to develop and showcase their planned DLC for Assassin’s Creed Unity. All of the DLC will be made available in the Season Pass which will include access to new missions, weapons, gear, skills as well as a brand new campaign. Season Pass holders will also have exclusive access to the new double-handed war axe. With a set price of $29.99, the DLC can be expected to see a release sometime in early 2015 on it’s presiding consoles. Expanding in to a different part of the Assassin’s universe, Ubisoft has introduced a completely different story line to follow that is set far off in another part of the world. Venturing beyond France and back to the 16th century, you embark on a new campaign in China as an antagonist known as Shao Jun. Shao Jun was portrayed in the animated movie Assassin’s Creed Embers. Her story takes place after her training with Ezio Auditore when she returns home to Beijing as the last remaining Assassin of the Chinese Brotherhood. Angered by her revenge, she sets out to strike down all of those who have destroyed her Brotherhood. This 2.5D mini-campaign is done in a different style of art then what Unity is based on. The game beautifully orchestrates an entirely new setting that was inspired by Chinese traditional brush paintings. Equipped with her new gear the Jian Sword and the Foot Blade, Shoa Jun will be able to quickly eliminate her targets from the shadows. If decided to take another course of action, you may use your powerful martial arts skills to take on groups in all-out combat. After the fighting is done, you may explore areas of the world including some of China’s legendary landmarks such as the Great Wall of China and the Forbidden City. There you will be able to meet famous historical figures and interact with them. 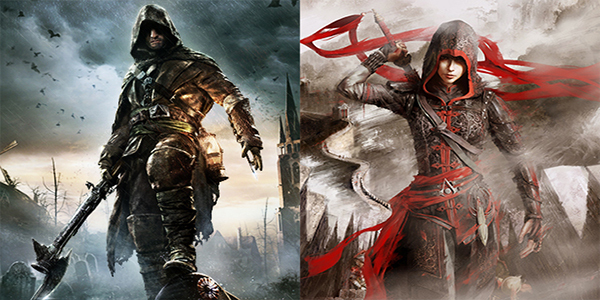 Another campaign known as Dead King will be added after the main story line of Assassin’s Creed Untiy. This mission takes you out of the bloody streets of revolutionary Paris and dives you into the darkened city of Saint Denis where you will be placed in a more disturbing setting, one that Ubisoft has yet to try with this series. The game takes place after Arno decides to leave Paris to seek isolation only to find himself wrapped up in the affairs of the mysterious town of Saint Denis. As you uncover the town’s mysteries, you will be forced to solve puzzles that lead to more side missions that will lead you into the lost underground catacombs. Scouring about underneath the city is a secretive Raider faction that has set out to stop you as you uncover the sins of the city. The DLC also comes with brand new weapons, one being the formidable Guillotine Gun that you will be able to take with you throughout the game. The Guillotine Gun fires heavy ammo out of its barrel, destroying anyone and everything in its path. Given that it’s such a big gun, the reload speed is very slow allowing for enemies to come in close for a direct attack. But you shouldn’t worry. With its sharpened blade at the top of the barrel, you should have no problem slicing through your enemies with little ease.